I'm going to be right up front here: I really didn't enjoy this book at all, and there are going to be spoilers galore in this review. 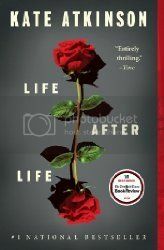 The idea behind Kate Atkinson's Life After Life is an intriguing one: Ursula Todd dies many, many times, yet her life resets itself each time with small, subtle changes which help her survive a little longer in each new life, until she gets her life right. However, we're never really told what the purpose of her life truly is. From the opening chapter where Ursula assassinates (doesn't assassinate?) Adolf Hitler, I assumed throughout the entire book that that was the purpose to Ursula's life, but it isn't. What Atkinson creates instead is a cyclical loop of a story where we watch Ursula die and then survive multiple times, through both World Wars, and then when it seems like she's gotten it all right, as she dies sitting peacefully in a park, the entire book STARTS AGAIN. I'm sorry (not sorry), but what kind of WTFery is this?! Hitler wasn't the point? Getting it all right wasn't the point? In fact, it seems that Ursula's life has no point whatsoever, just to go round and round and round, never ending and never changing? Thank you, but no thank you. Now, you're probably asking yourselves, "David, why in the world did you finish the book if you disliked it so strongly? ", and I would say that is a very good question. First off, I was honestly impressed with Atkinson's writing. There are some truly beautiful moments in the book, but there are also some ridiculously tedious sections to get through, and I won't lie, by page 350 or so, I was skimming huge swaths of text, as I was just having a terrible time caring about what was happening. More often than not, I just wanted to throw the book against a wall. Secondly, I was genuinely intrigued to see how Ursula's life was going to play out. I wanted to know what the point was to her life, and then to find out that there really wasn't a point to her life... well, I really felt like I had been cheated out of an ending for the book, and that pissed me off. Personally, I think there is a great story in here that could have used a couple more strong editing sessions. If this had been about 200 pages or so less and far more condensed, I think this would have been just about perfect for me.